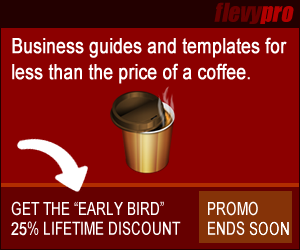 Currently viewing the tag: "business templates"
Flevy.com is a marketplace for business documents–ranging from PowerPoint Templates to Business Presentations to Financial Models. The marketplace launched just late last month. Flevy was founded under the principle that companies waste a lot of time and money recreating the same foundational business documents. Flevy’s vision is to become a comprehensive knowledge base of business documents. All organizations, from startups to large enterprises, can use Flevy–whether it’s to jumpstart projects, to find reference or comparison materials, or just to learn. PowerPoint Templates – Refers to functional PowerPoint Templates (e.g. Gantt Charts, Approach Diagrams, etc.). Strategy, Marketing, & Sales – Topics include Growth, Innovation, Branding, Digital Marketing, Sales, Distribution, Pricing. Operations – Topics include Process, Product Development, Purchasing/Sourcing, Supply Chain, Logistics. Corporate Finance – Topics include Capital Management, Accounting, Tax, M&A, Valuation. Information Technology – Topics include Application Management, Infrastructure, Telecommunications. Organization, Change, & HR – Topics include Leadership, Change Management, Governance, Compensation, Talent. Risk – Topics include Banking Risk, Corporate Risk. Outsourcing – Topics include IT Outsourcing, Business Process Outsourcing, Knowledge Process. For the business professional, Flevy also presents a great opportunity to make sustainable, passive income. Just as the mobile apps market has helped software developers earn sustainable, passive income, Flevy will do the same for business professionals. If you are interested in becoming a seller on Flevy, you can register here: flevy.com/register. Additionally, Flevy offers a generous Referral Program, allowing sellers to refer other sellers. The program is 2-tiered, meaning you can earn sales up to 2 levels downstream.